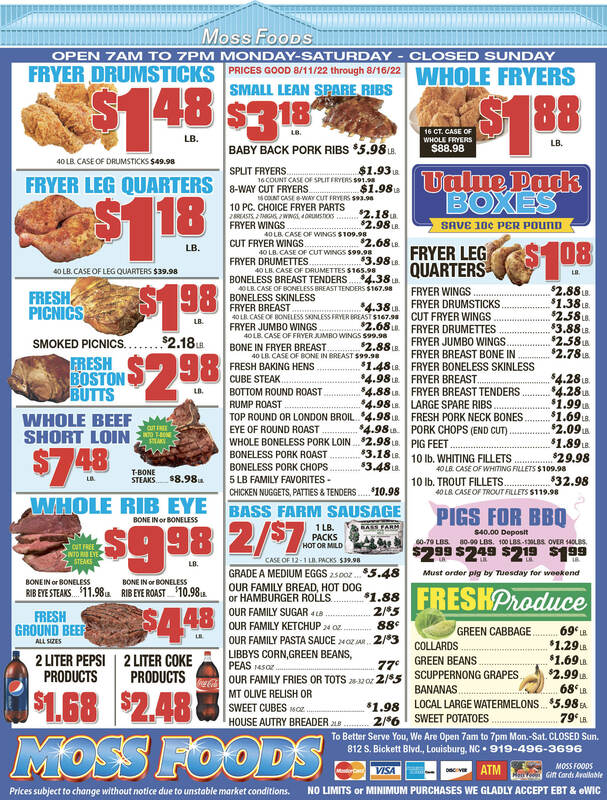 Showing 50 articles from April 16, 2014. Year-old allegations surface; just ‘politics’? LOUISBURG — Revelations that accounting procedures by a former clerk of court may have risen to the criminal level are politically motivated. At least those are the thoughts of two key individuals involved — the former clerk of court, Alice Faye Hunter, and the woman who replaced her, Patricia Burnette Chastain. The Easter Bunny hands a treat to Haven Payne, left, as her grandfather, Dan Surles, looks on. 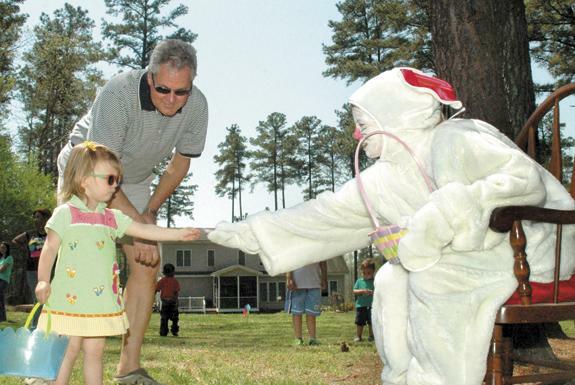 The exchange was part of the Friends of the Youngsville Library’s Easter celebration on April 12. 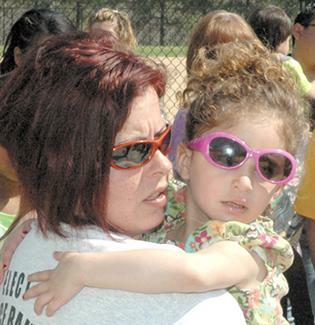 See more photos from the Youngsville and county event on Page 5A. 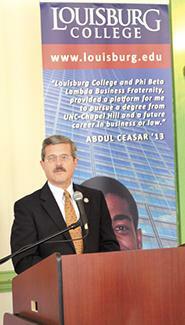 “The march goes on” toward a brighter future for Louisburg College, said the school’s president, Mark La Branche, as he presented the annual State of the College message at a Chamber sponsored breakfast last Thursday. Dr. La Branche outlined a number of improvements and projects that are underway or pending -- and noted that the school’s total net assets grew by $1.1 million from operating activities in the last year, the fifth year the college has shown an increase from operations. LOUISBURG — Prosecutors say they can’t let the prospect of repercussions and ramifications impact their decisions to pursue charges against hardened criminals. Those thoughts, though, were shaken a bit last week when local, state and federal officials arrested five people on charges of kidnapping the father of a Wake County prosecutor — a ripped-from-the-headlines plot orchestrated by a man jailed because of the efforts of said prosecutor. 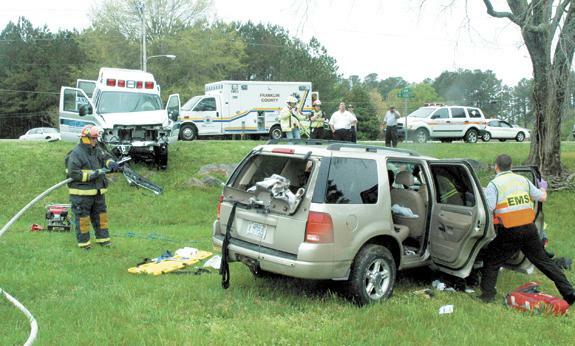 The driver of the SUV in the foreground, Christopher Yancey of Oxford, was charged with failure to yield the right-of-way that resulted in a crash with an ambulance at the intersection of Bickett Boulevard and Main Street in Louisburg the afternoon of April 15. Yancey was taken to Franklin Medical Center where he was treated for non life-threatening injuries. No one in the Bertie Ambulance Services Inc. vehicle was taken to the hospital. YOUNGSVILLE — Commissioners plan to use a scheduled work session to get down to business. Commissioners meet once a month for official business and — save for unofficial committee meetings — don’t get to do enough brainstorming and sharing as a group, officials said. As a result, they’ve scheduled a Saturday work session in June, giving the group a chance to roll up their sleeves and spitball matters that don’t always get brought up in public meetings. These beautiful spring days have many people looking around for fun — yet inexpensive — things to do. One of the best in the state is coming up on April 26 and 27 about a hundred miles east of Louisburg. It’s Living History Weekend in Plymouth, down in Washington County, which is a little more than halfway between The Burg and Manteo right along U.S. 64. College’s brightest days ahead and that’s great! That statement from Louisburg College President Mark La Branche speaks volumes, especially when he’s taking about a school with a distinguished 225-year history that has changed the lives of countless students for the better. Instinctively, many of us have long believed that the potential for an even brighter future than its distinguished past was possible for the school. As co-founder of We the People-Franklin County Patriots, I was very disappointed to read about the attacks by the Franklin County Democrat party on We the People and any democrats who attended or spoke at our meetings. We say it over and over - WTP-FCP is a non-partisan conservative group. From reading Steve Trubilla’s Franklin Times columns, I had somewhat drawn the conclusion that Trubilla is a man who was open-minded in search of the truth on various issues of importance to himself and others. I have respected his views and his right to share them with us. A duck is a duck is a duck despite what it calls itself! I talked to a neighbor the other day who told me the last person he voted for was Bill Clinton. That means he has not voted since at least 1996. He felt he was bombarded by too much contradictory information and simply did not know what to believe. 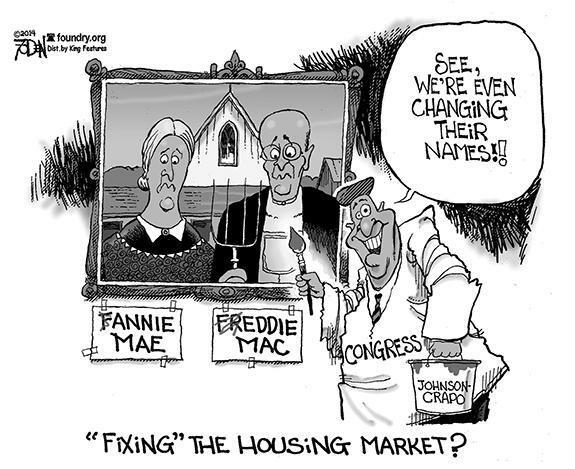 What are real issues? And do they matter? 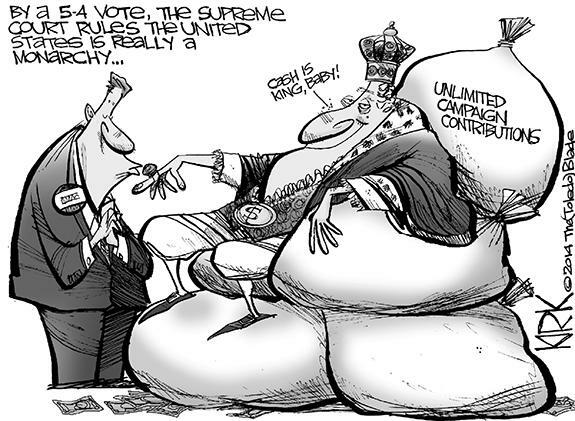 If there is one thing I think we can all agree on, it is that we do not like dirty politics. Political operatives are trying to make a big deal out of why I have commented in a positive way on Patricia Burnette Chastain. Seems they favor Shelley Dickerson for Clerk of Court and figure by saying I am a right wing Tea Party Leader nut case, they can get you to vote for Dickerson. NASHVILLE - Funeral services for Eddie C. “Biggeon” Marsh, 86, who died Wednesday, April 9, 2014, were held Sunday, April 13, at Castalia Baptist Church, with the Rev. Victor Fenner officiating. Burial followed in Oakwood Cemetery. CASTALIA – George Jerome Brokenshire, 88, of Castalia, died Monday evening, April 11, 2014. FRANKLINTON - Ray McArthur Alston, 70, died Thursday, April 10, 2014 at Duke Hospice Hock Family Pavilion of Durham. Funeral services were held Tuesday, April 15, at Hawkins Chapel Missionary Baptist Church, Franklinton, with the Rev. Walter S. Taylor officiating. Interment was in the church cemetery. LOUISBURG - Funeral services for Robert “Darren” Davis, 47, who died Tuesday, April 8, 2014, were held Saturday, April 12, at Walnut Grove Baptist Church, with the Rev. Timothy Walker officiating. Burial followed in Oakwood Cemetery. LOUISBURG - Funeral services for Robert Lee “Bob” Dunston, 68, who died Tuesday, April 15, 2014, will take place Saturday, April 19, at 1 p.m. at the Richardson Funeral Home Chapel. Burial will follow in the Union Grove Church Cemetery. 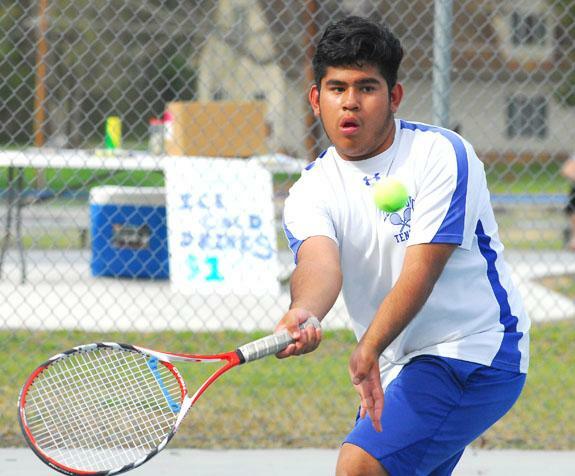 LOUISBURG -- With the Tar-Roanoke Athletic Conference championship all but clinched, the Louisburg Warriors continued to prep for the boys tennis postseason by hosting a pair of key matches at the LHS Courts. Last Friday, the Warriors entertained Class 3-A Oxford Webb and earned a 6-3 team decision. Louisburg’s heroics continued Monday as the Warriors, coached by Johnathan Waugh, delivered a 6-3 triumph over Kerr-Vance Academy. OUT CLAUSE. Louisburg College pitcher Jon Stires (right) retires a Spartanburg Methodist runner at first base as part of last Saturday’s home twinbill. 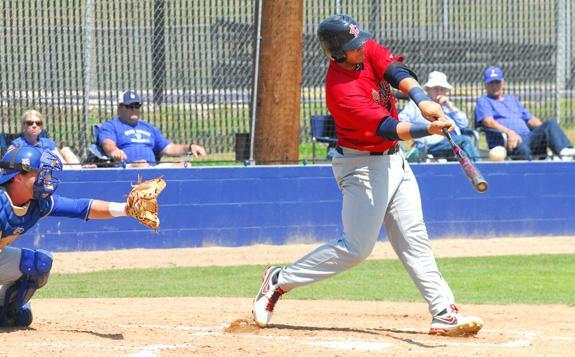 LOUISBURG - Despite what their record would indicate, the Louisburg College Hurricanes have already displayed a penchant for being competitive with any Region X baseball opponent. But transforming that compete level into victories is something the Hurricanes are still in the process of ironing out. 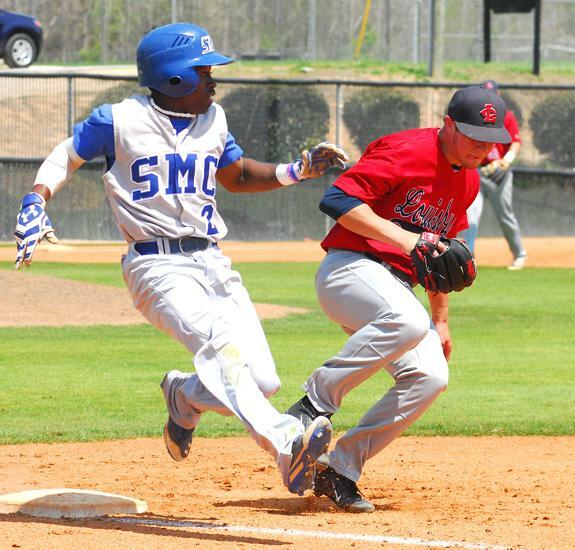 That was evident last weekend as LC hosted region leader Spartanburg Methodist College -- the nation’s second-ranked team -- for a four-game series at Frazier Field. BALL CONTROL. Louisburg’s Phoenix Spivey tries to chase down a loose ball during last Thursday’s home match with Northern Nash HS. 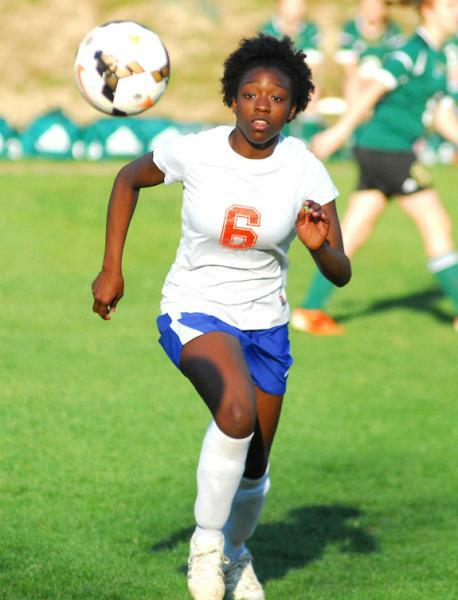 LOUISBURG -- The Louisburg High School girls soccer squad continues to try hard while improving, but the Lady Warriors would prove to be no match last Thursday for traditional powerhouse Northern Nash. NNHS delivered 10 goals in the opening half to invoke the mercy rule as part of a 10-0 decision over the Lady Warriors at Joyner Park. BUNN -- If ever there is a perfect hardwood match, it’s between Deshawn High and Louisburg College. High, Bunn’s senior basketball standout, was looking to continue his career at a school close to home. Just 10 miles down the road is Louisburg -- one of the nation’s top junior college hoops programs. And LC coach Mark Vanderslice has known about High for three years -- and was plenty anxious to get the Bunn sharpshooter on campus for the next two seasons. SHOT STAR. 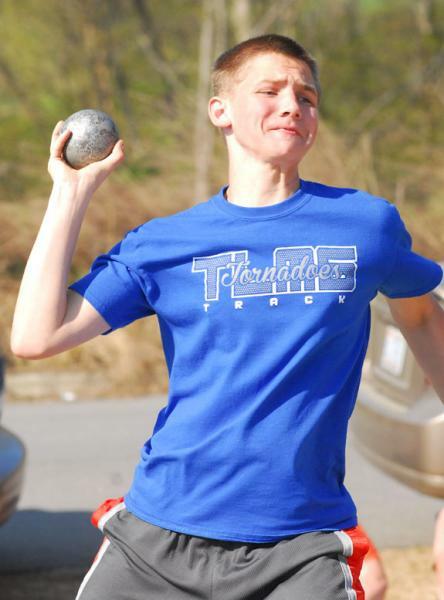 Franklinton Middle’s Jeramiah Edgerton competes in the Boys Shot Put as part of last Saturday’s MAC-10 Track and Field Championships in Franklinton. 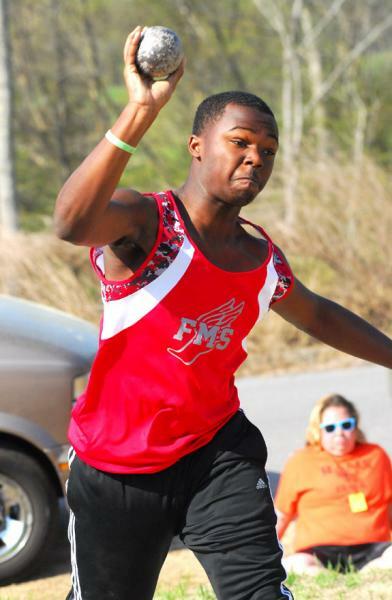 FRANKLINTON -- Before the event began, most league coaches agreed that the race for the MAC-10 Track and Field Championships was destined to be a tight one. 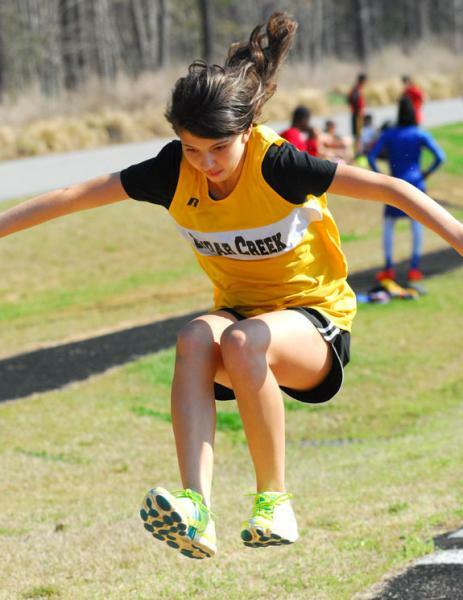 But in the end, the final standings were the same as they were in 2013 -- with Cedar Creek Middle School claiming both team crowns in the annual championships, which were held last Saturday at Franklinton High School. BUNN -- After 14 star-studded seasons, Gerald Melton will no longer be coaching the boys basketball program at Bunn High School. Melton, who led the Wildcats to the state playoffs every season, has announced his resignation. He is in the process of accepting a teaching position in Wake County, but is unsure about his coaching future. PERSON’S PLACE. Louisburg’s Maurice Person slides safely into third base during last Friday’s home triumph. 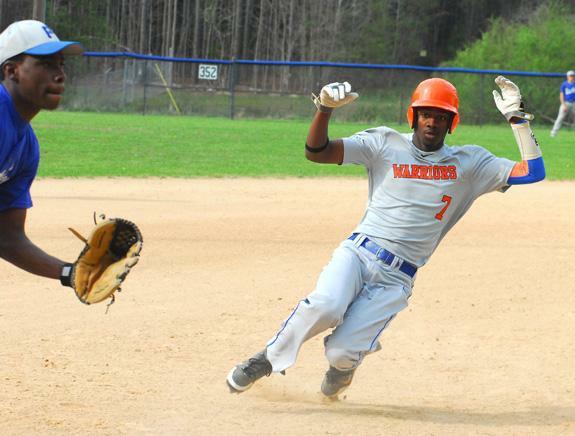 LOUISBURG -- A recent push has left the Louisburg Warriors in contention for the Tar-Roanoke Athletic Conference baseball championship -- pending two upcoming matches with Granville Central. LHS and GC will determine the TRAC title holder during their meetings later in the campaign. To put themselves in that position, the Warriors rolled through a trio of overmatched conference opponents during recent action. FOUR OAKS -- Thanks to a pair of victories against higher-classification foes, the Bunn Wildcats have moved into the championship game of the Johnston County Eastern Invitational Baseball Tournament at South Johnston High School. 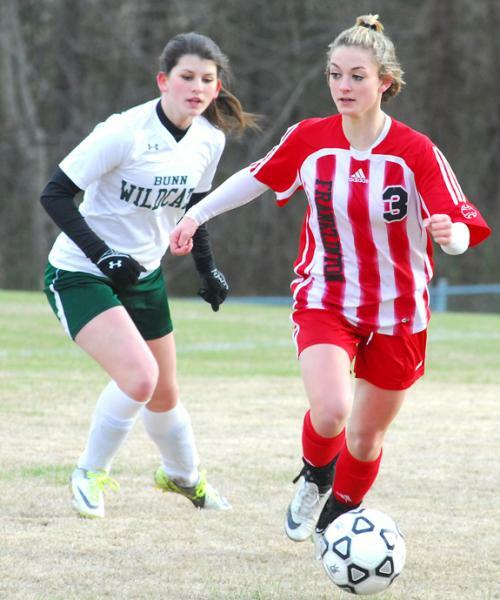 The Wildcats were scheduled to tangle with Class 4-A West Johnston in Wednesday’s finale. BHS won’t have much time to prepare for Friday’s key home Northern Carolina Conference showdown against South Granville. WOODBRIDGE, VA. -- After things looked bleak on the outset, the Carolina Mudcats responded with a resounding 12-2 win over the Potomac Nationals on Sunday at Pfitzner Stadium thanks to a great spot start from D.J. Brown and a resurgent offense. The Class A Carolina League baseball game veered off its expected course from the first inning as both bullpens were called into action before the third frame. SUPER SOPHS. 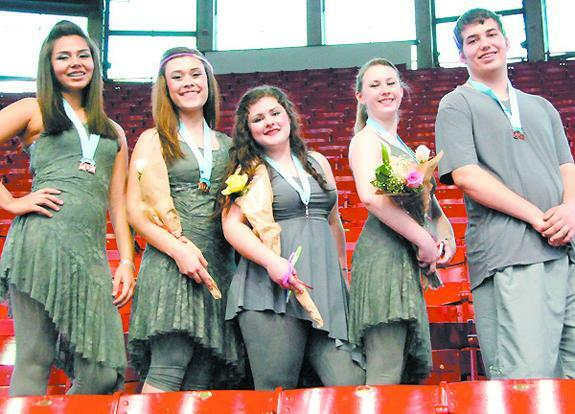 Members of the Franklinton High School sophomore class posed for a photo following the A1A Championships, which were held at Dorton Arena in Raleigh. FRANKLINTON -- While the footballs are being stored away and the marching band takes a seat, the work is just beginning for members of the Franklinton High School Color Guard Flag Corps. Most casual observers only see the corps performing at halftime of gridiron struggles in the fall. 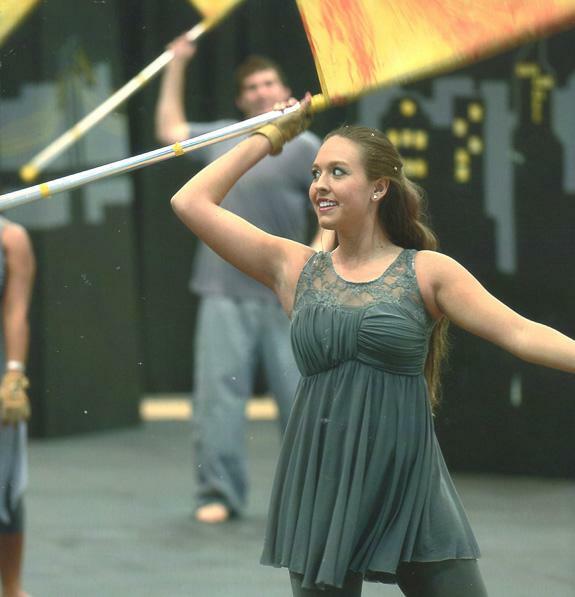 But once the season ends, the corps turns into the Franklinton Winterguard, which takes part in several performances from January through April. ONE OF 36. 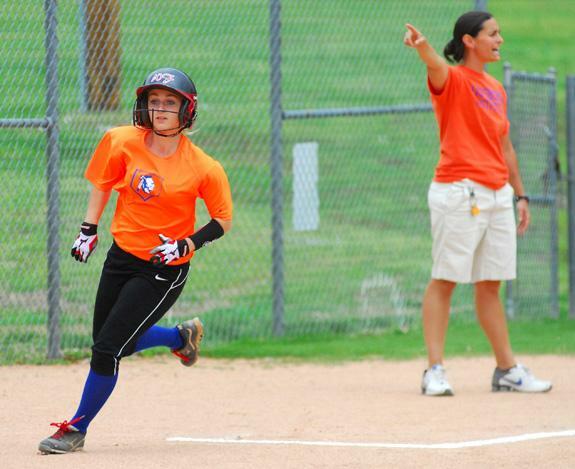 Louisburg’s Katlyn Tharrington (left) scores a run during the Lady Warriors’ 36-0 victory Monday over Weldon. LOUISBURG -- Just as expected, the Tar-Roanoke Athletic Conference softball race appears to be a two-team joust between Louisburg and Granville Central. Round one of the duel was supposed to be held Tuesday in Stem, but the contest was called off due to poor weather. One day earlier, LHS had continued its roll through the TRAC with a 36-0 home triumph against the Weldon Mighty Chargers. FRANKLIN COUNTY -- Alumni basketball games for each of Franklin County’s three high schools will be held April 25 at the Louisburg High School Gymnasium. A girls contest will be held at 6 p.m., with alumni from each school welcome to participate. At 7 p.m., there will be a boys game for Louisburg High School alums. SOCCER SPECIALIST. 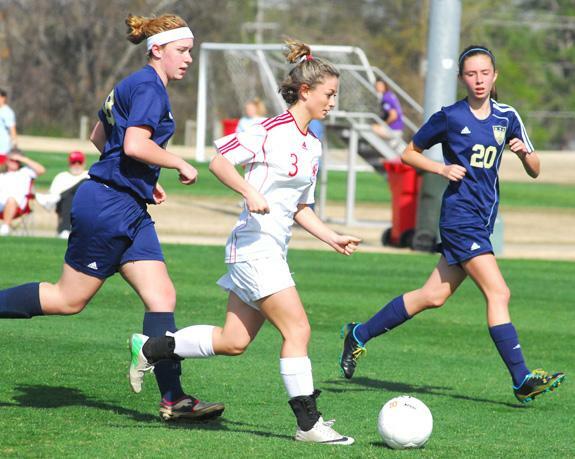 Krista Strain (middle) has enjoyed a strong soccer career for the Franklinton HS Lady Rams. 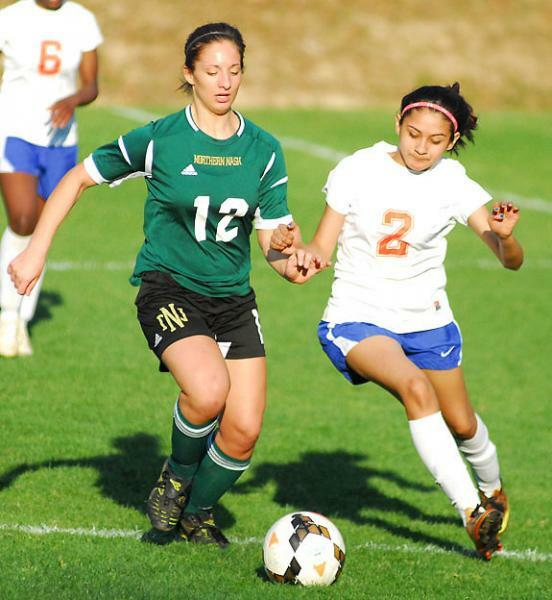 FRANKLINTON -- Andy Stokes’ recent accentuation on Franklin County players continued last Thursday when Franklinton’s Krista Strain signed a letter-of-intent to join Stokes’ Louisburg College women’s soccer program. Strain, a speedy performer with experience both up front and in the midfield, will join at least four other county alums next season at LC. CAUGHT IN A RUNDOWN. 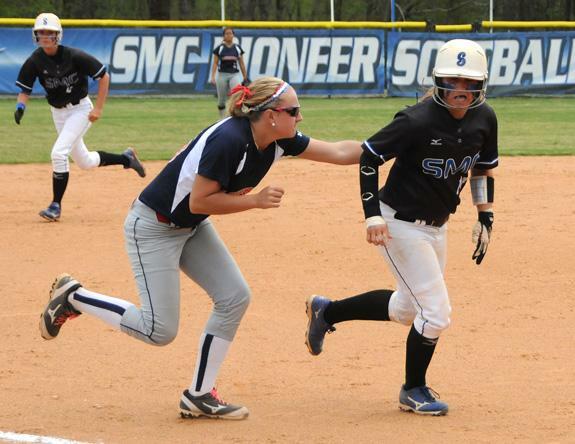 Louisburg College’s Megan Johnson (left) tags out a Spartanburg Methodist baserunner near third base. SPARTANBURG, S.C. -- The Louisburg College softball team dropped its final two games of the weekend as Spartanburg Methodist College took Sunday’s contests 11-7 and 4-0 in the Palmetto State. LC got down early, 3-0, in the first game, but a six-run rally in the fourth got the Canes their first lead at 6-3. Both teams traded runs in the following inning, but a big Pioneer sixth put the game out of reach for the Lady Canes. NORFOLK, VA. -- East Carolina University scored five runs in the top of the 12th inning, claiming a 12-7 baseball win over Old Dominion on Sunday afternoon at the Bud Metheny Complex. With the win, the Pirates improved to 21-15 overall and 9-6 in Conference USA action, while the Monarchs drop to 22-15 and 10-8. 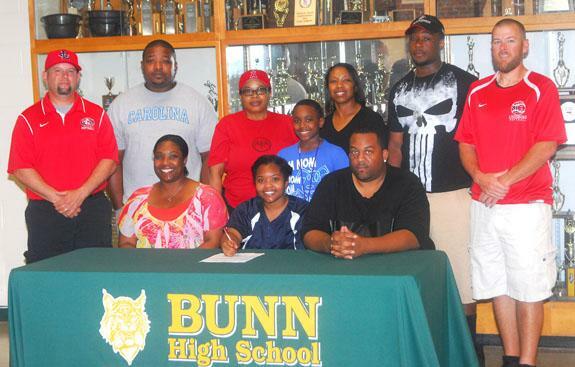 BUNN -- Louisburg College softball coach Don Stopa wasn’t deterred by the fact that Bunn’s Jazmaine Mayo chose not to suit up for the Ladycats fast-pitch squad this spring. Instead, Stopa knows about Mayo from her travel ball work with the North Carolina Strike Force. “A big thing for me is how competitive someone’s summer schedule is,’’ Stopa said. Northern Nash’s Natalie DePalma (left) tries to hustle toward the ball alongside Louisburg’s Evelyn Nolasco (right) during last Thursday evening’s girls soccer showdown at Joyner Park in Franklin County. Franklinton’s Krista Strain (right) tries to find a teammate during an early-season Northern Carolina Conference matchup versus rival Bunn HS. 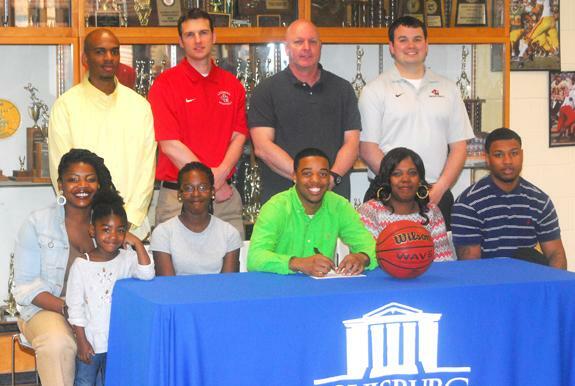 Louisburg College’s C.J. Needam takes a mighty cut during last Saturday’s home baseball doubleheader. Junior Katie Pleasant served as a co-captain this season for the Franklinton High School Winterguard. Ashley Dickson helped the Cedar Creek Lady Jaguars earn the MAC-10 Track Championship. Terrell Lane’s Hunter Thomas competes in the Boys Shot Put during last Saturday’s MAC-10 Championships. EASTER FUN. 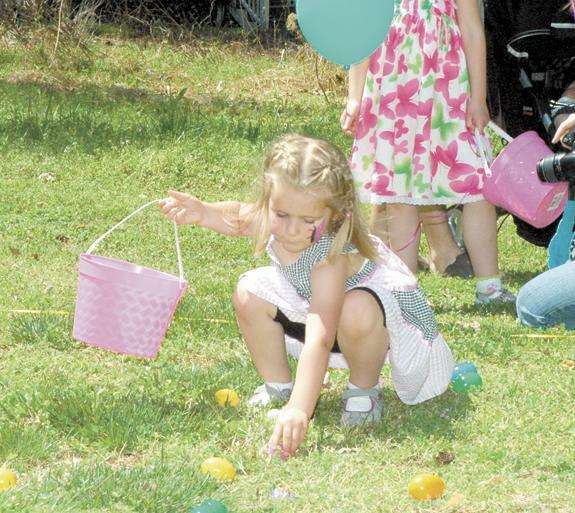 Emma Gorczynski gets a good look at eggs as she fills her basket during the Easter Egg hunt on the premises of the Youngsville Library. Organizers set up several hunts throughout the afternoon for different age groups. The Easter Bunny also showed up for a visit during the event. EASTER FUN. 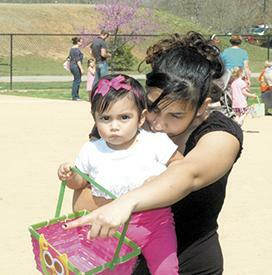 Before the Franklin County Easter Egg Hunt got started at the Franklinton Park, Anna Barrera points out the prized eggs to her daughter, Victoria Osario, who had her basket ready to be filled. LOUISBURG — On Friday, April 25, at 7:30 p.m, songstress Rita Coolidge will be performing at Louisburg College’s JPAC. Students in HIS 221 (North Carolina history) at Louisburg College recently undertook original research that sheds new light on the life of Abigail House, a rough-hewn, illiterate farm woman who lived on a small farm east of Franklinton before, during, and shortly after the Civil War. Known affectionately as “Aunt Abby,” she became famous during the Civil War for her heroic efforts to take care of her eight nephews and other soldiers who fought for the Confederacy. FRANKLINTON — Police have issued an arrest warrant for a man accused of assaulting a woman twice within the last two weeks. The evening of April 15, officers responded to reports of shots being fired into an apartment in Academy Village on Hawkins Street. At some point in life, birthdays seem to become an unwanted reminder of growing old, something the celebrant would just as soon downplay. Not the case for Lorene House. She loves getting the attention more than ever. 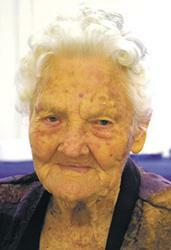 Mrs. House celebrated her 103rd birthday on Sunday, Feb. 23, as her family, church and community friends gathered on Saturday, Feb. 22, to celebrate with her. 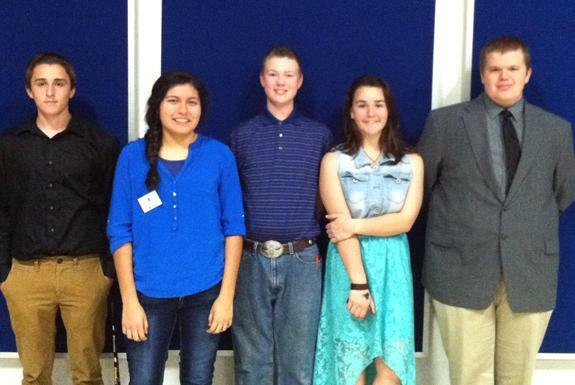 Teen Retreat participants (from left) were Jake Moore, Isabel Nobles, Jacob Noe, Sage Moore and Joey Moore. Some people may not know 4-H extends outside county lines, but those of you that do know a little about 4-H know how beneficial 4-H programs can be and how well youth excel in multiple areas, such as public speaking, decision making, and other life skills. This March, local 4-H’ers have been extremely busy participating at events on the Northeast 4-H District level.